CLICK HERE FOR IMPORTANT NEWS ABOUT PROHEART 6! Veterinarian once meant someone who treats your pet when he or she is ill. Today's veterinarian is someone who strives to keep your dog, cat or other pets healthy and happy so they won't get sick. The veterinarian is your partner in fostering the human-animal bond. The Veterinarians and staff at Voss Road Animal Hospital in Houston understand this. We offer a full range of modern, high-tech facilities and veterinary services. This includes general and orthopedic surgery, an in-house full service lab, dental services, professional grooming and bathing and year around boarding for dogs and cats. We also use only the finest products to treat your special friend, including Heartgard, Advantage, and Purina specialty foods. 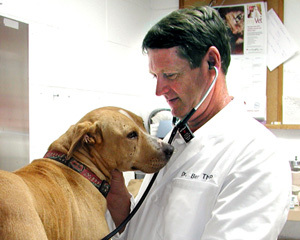 Veterinarians Dr. Benjamin Tharp and Dr. Marc Hays combined have more than 50 years veterinary experience. They will not only treat your sick or injured pet, they will also counsel you in how to keep your pet healthy and energetic. On our website you will find information about the clinic, our upcoming events, the products we use, video of our activities and more. You can also make an appointment for your pet to see a veterinarian, or make a boarding reservation online via email. Please email us with comments or suggestions.